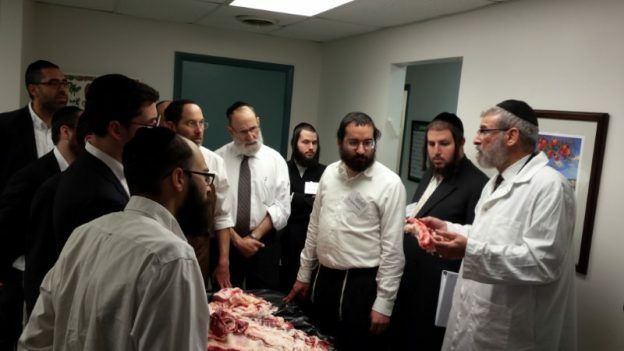 It didn’t take long for the boardroom at STAR-K Kosher Certification’s headquarters in Baltimore, Maryland, to be converted from a lecture hall, where STAR-K Kashrus Administrator Rabbi Zvi Goldberg presented a PowerPoint about mislabels and fraud, into a makeshift “operating room”. Dressed in a starched white butcher’s coat, performing the delicate “surgery” on the bright red, fleshy section of a beef forequarter laying before him on the table, was STAR-K Kashrus Administrator Rabbi Mayer Kurcfeld. 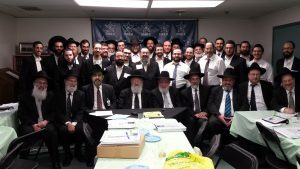 The 38-year veteran menaker explained every step of the process of the ancient mesorah of traiboring to the huddle of the agency’s 14th Annual Kashrus Training Program’s participants surrounding him. The crash course on removing the prohibited veins, arteries, chailev (prohibited fats), and portions that attach to and get nourishment from the chailev, including enabling free flow of blood during the kashering process, was just one of the many invaluable skills that they learned from July 24-27.